On 13 March, TROX GmbH and TIBA El Manzalawi Group signed a joint venture agreement. With this new joint venture TROX enters into yet another promising business partnership and strengthens its position in Egypt. TIBA's goal is to add ventilation and air conditioning components to its portfolio. To this end, TROX and TIBA are going to manufacture ventilation and air conditioning components, and specifically components for air distribution. TROX and TIBA have already been working together closely for two years in the manufacturing and marketing of air handling units and fan coil units. The new joint venture aims at serving the Egyptian market as well as the markets in the Middle East and in North and East Africa. The TIBA El Manzalawi Group, whose headquarters are in Cairo, is one of the largest enterprises in the HVAC industry in Egypt. TIBA manufactures and sells air conditioning components for both the residential and commercial sectors. Signing the agreement (left to right): Thomas Mosbacher, Member of the Board of Management of TROX GmbH and responsible for Finance, HR and IT; Shady El Manzalawi, Managing Director of the TIBA El Manzalawi Group; Udo Jung, Member of the Board of Management of TROX GmbH and responsible for Technology, Sales and Marketing; Mohamed El Manzalawi, Head of Sales of the TIBA El Manzalawi Group. After signing the joint venture agreement (left to right): Thomas Mosbacher, Member of the Board of Management of TROX GmbH and responsible for Finance, HR and IT; Udo Jung, Member of the Board of Management of TROX GmbH and responsible for Technology, Sales and Marketing; Mohamed El Manzalawi, Head of Sales of the TIBA El Manzalawi Group; Maher Elsherif, Minister Plenipotentiary, Embassy of Egypt in Berlin; Christine Roßkothen, Head of Corporate Marketing, TROX GmbH; Tarek Sherif, General Managing of TROX TIBA; Shady El Manzalawi, Managing Director of TIBA El Manzalawi Group; Ludger Bökmann, Head of Sales for EMEA, TROX GmbH. TROX is a global leader in the development, manufacture and sale of components, units and systems for the ventilation and air conditioning of rooms. With 27 subsidiary companies in 25 countries on 5 continents, 14 production facilities, and importers and representatives, TROX is present in over 70 countries. 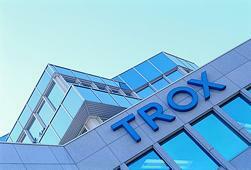 The TROX GROUP currently has nearly 4,000 employees and generates revenues of roughly 500 million euros.